As briefly highlighted in last week’s column, the discussion of Sino-African cultural and trade relations and the probe into how balanced they are, was among the prickly issues that stimulated considerable debate at the recent African Creative Economy Conference (ACEC 2013) held in Cape Town, South Africa. In trying to give the relationship a proper background, Senegalese scholar, Dr Daouda Cisse, a research fellow at the Centre for Chinese Studies, University of Stellenbosch in South Africa highlighted the recent unprecedented increase in trade between China and Africa. In a paper entitled China's engagement in Africa: opportunities and Challenges for Africa, Dr Cisse read out that in 1997, trade between the two was worth US$5 billion; US$11 billion in 2002; US$107 billion in 2008; US$160 billion in 2011; and US$198 billion in 2012. He indicated that China is now Africa’s largest trading partner, and it was essential that the continent jointly develops and implements a clear strategy on how it engages with the most dominant of the eastern tigers. He advised that among other more individual channels, it was important for the continent to take a more organised and pragmatic approach in its dealings with China, especially making use of regional institutions such as SADC, EAC, ECOWAS and COMESA – among others. The China educated economist, who has a Ph.D. in Economics from Zhongnan University of Economics and Law argued that there was a need to develop policies to diversify Africa’s imports to China through support for the manufacturing sector and that in addition, it was important to put in place regulations covering sustainable development, labour conditions, norms and standards. Dr. Cisse fears that while Chinese investment has been concentrated in Africa’s natural resources sector, notably oil and mining, as well as infrastructure, there has been significant diversification in recent years with the arrival of more private companies and SMEs. Hence the need for African countries to reap the benefits of this investment by developing its own key sectors, particularly manufacturing and services. The aim: to build capacity, transfer knowledge and technology – and create jobs for Africans. 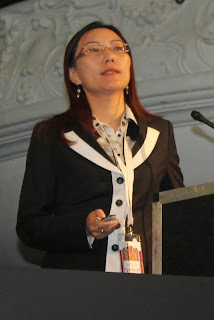 However, speaking a day later, Dr Marina Guo, Vice-Director, John Howkins Research Centre on Creative Economy, Shanghai made what could have easily been an unintentional response to Dr. Cisse’s presentation in a paper entitled When Creative Africa meets China. Clearly avoiding intellectual rhetoric, Dr Guo skilfully offered her honest piece of guidance on breaking down the barriers to doing business in China with particular emphasis in the areas of arts, culture and the creative industry. “We all know China is one of the biggest emerging markets and despite being the second largest economic power its GDP is very low, figures show that China ranks 89 in the world,” she explained “However, there is a kind of rising creative economy in China, although there has been a slump in GDP, from 10 per cent to 8 per cent and last year 7.6 per cent. The demand for creative goods – paintings, crafts, pottery and fabric -- continues to grow rapidly because of the huge emergence of a middle class with disposable income”. She said that professional services network Deloitte has estimated that China’s cultural industries will grow at 20% per annum over the next seven years. She clarified however that this growth cannot be possible without what she termed the “right government policies” to foster the production, consumption and management of creative products. “In china there is a national policy which allocates 4 per cent of the total GDP of the budget to be spent in the education sector. Over the last few years maybe 8 to 10, we have more than 580 universities and colleges that launched programmes across the creative sector and cultural management to enable young talent to engage with the creative industries, so each year we have about 6 million graduates looking for jobs, it is very competitive” stated Dr. Guo who is also Head of Arts Management and Director of International Programmes at the School of Creative Studies, Shanghai Theatre Academy. According to Dr Guo, the government and private sector have been working together to build infrastructure, and leading cities like Beijing and Shanghai realised that talent is more important than infrastructure so they have been investing more into the people as well. When the individual creativity turned into a phenomenon across the sector, the business community came in and more and more financial institutions have been engaged in the process of creative economy development. “The film industry in china is interesting. Everyone talks about Hollywood, Bollywood and Nollywood, what you might not know is that china has already become the second largest movie market in the world,” she explained “The box office increases at 30 per cent in the past decade and half of the films are produced in china and the rest are imported, mainly from Hollywood, there is also an increasing wave of cinemas about 13,000 and there are about 10, new cinemas opened every year”. She said recently Beijing invested 10 million Yuen into the cultural sector to support the businesses and help launch them on to the international market. “We used to be called the factory of the world, but now we are making efforts to transform from ‘made in china’ to ‘created in china’”, she boasted. Although entry into the Chinese creative market is competitive, according to Dr Guo, there are a few areas that can allow penetration. She observed that African arts and culture do have a role to play in the cultural diversity of China. She also highlighted three branches of the creative sectors that have great potential on the Chinese market: design, contemporary visual arts and digital content with African features such as African music or African stories. She said Chinese consumers are more willing to pay more for unique African experiences rather than traditional African arts and crafts while suggesting need for a united, pan-African cultural identity − as opposed to separate national identities – and that currently Egypt and South Africa are the most recognised countries in China. She explained that a sound understanding of China’s business culture combined with strong, trust-based relationships with clients and partners are essential for business success in China. She advised African countries to be more forceful in attaining a permanent cultural presence in China through cultural exchange and trade fairs. “There are opportunities, but it is to catch the fast train as we say in China, we should make a dream to sell the African culture to the Chinese, it’s not a mission impossible, what do we need to do? Put our hearts; mind and hands together and work in joined force and make it happen,” concluded Dr Guo. As much as it was interesting to note Dr Guo’s suggestion that there was “need for a united, pan-African cultural identity”, and the continent should market itself as such, it brings to mind the thought that Africa is not a country, a misconception equally championed by trade and funding partners from the west. Africa is not a country and this could not have been put in simpler terms than that of an excerpt from the Hangzhou Declaration that reads: “We recognize that one size does not fit all and that different cultural perspectives will result in different paths to development”. The Hangzhou Declaration entitled “Placing Culture at the Heart of Sustainable Development” is the outcome document of the UNESCO International Congress, “Culture: Key to Sustainable Development” held in the city of Hangzhou, China from 15 to 17 May this year, with the support of the China government that brought together 500 participants from 82 countries. The purpose of the congress was to spearhead the integration of culture within development policies and programmes worldwide. It proposes that culture should be included as the fourth fundamental principle of the post-2015 UN development agenda, in equal measure with human rights, equality and sustainability. “Special support should be provided to cultural programmes that foster creativity and artistic expression…” reads the declaration in part. Nevertheless, as the Sino-African cultural and trade relations debate is brought to the boil and the move for UNESCO to push the arts, culture and heritage to the forefront of priorities on the post-MDG agenda prevails, the Zambian creative sector remains in purgatory while the nations Arts, Culture and Heritage Bill – thought to be the sectors salvation by its architects – is yet to be tabled in parliament. Speaking on Radio Phoenix’s Arts in Perspective programme sponsored by Yezi Arts Productions and presented by Raphael Zimba on Thursday last week, the National Arts Council (NAC) Vice-Chairman Sankwe Kambole shed some much needed light on the Bill’s formulation and its anticipated prospects. “My experience has been subtle at times close to crying because you can see the potential that the [creative] industry has and the failure among ourselves in the industry to partner and form a cohesive force so that at least we can optimise on this potential,” he said. He added that the fraternity had been crying for a long time for a mother ministry and not until the coming in of the Patriotic Front government has some aspects of the cultural sector seen some streamlining. According to Kambole things look very good because Zambia has a government that is focused on helping develop the sector so that it can contribute to national development. “The Arts Culture and Heritage Bill proposes to bring together all aspects of the cultural sector from the intangible and tangible aspects of culture to the performing or live aspect of the arts. What this bill tries to do is to bring everyone under one institution which is proposed to be the National Arts and Culture Commission so that at least we optimise the visibility of the sector, the finances that are given to the sector and we reduce on the fragmentation,” he explained. He emphasised that the fragmentation of the sector disturbs the flow of funds and implementation of projects. He observed that looking at the budgetary allocation of the sector, although funds can be sufficient these are distributed in different departments and in separate ministries, harnessing and accessing these monies becomes difficult. “The PF government actually activated the need for us artists to come together because they saw the industry has the potential to create wealth, to create jobs and also to contribute positively to GDP. We often complain that we are not recognised; yes we are not recognised because we do not contribute to the tax net. You will be recognised if you contribute to the tax,” he added. He explained how the bill came about citing political will and commitment by the republican president. He revealed that NAC organised a workshop that was held in Lusaka to evaluate and share information about the proposed commission in November, 2012. The workshop attracted over 70 individual participants and stakeholders such as government departments; Traditional Affairs, Department of Cultural Affairs, Heritage Commission and the Museums who made a presentation on how they perceived the commission. “From here there was a communique among other things that thanked the government for bringing all the art forms together and they recommended that a roadmap be developed and in this roadmap a smaller technical committee be appointed by the PS responsible for the portfolio of the arts so that they spearhead the development of the arts culture and heritage bill” he said. 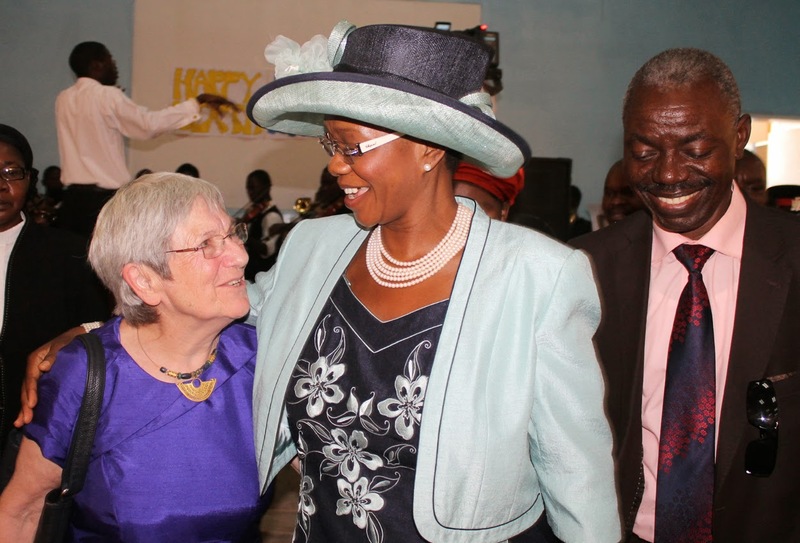 The committee was appointed by the PS of tourism and arts in February this year and Kambole was appointed secretary while former NAC Chairman Mumba Kapumpa was appointed chairman. Kambole said there were a number of members on the committee including a few he referred to stakeholder and it was after these appointments that the committee sat and received the draft bill from Eva Jara the legal person assigned for the task. “The bill will create a commission and it will be headed by a director general, so we will have specialised directorates headed by directors responsible for the performing arts, literary, creative arts, heritage these will have power to run the commission,” he explained “We will be able to get the little monies that are spread all over and embark on capital projects. One of the aspects that have been recognised is to have professionals in the sector you know we do not have an institution of higher learning that gives training to professionals in the cultural sector”. Kambole who has an MA Urban Management and Development from the University of Erasmus in the Netherlands, another MA in Water Resources Engineering from the University of Zimbabwe and a BSc honours in Hydrogeology confessed that he was from an engineering background, but what brings him and other arts administrators together is interest in the sector but they [administrators] want to have professionals and the bill recognises that. He was Nataaz chairman for four years and was very active in theatre in his school and student years, nonetheless. “You know we don’t have the national gallery, we can’t even account for the indigenous paintings, we do not have what we call a national collection and where it is stored so all these forms of creativity once they are stolen they will be very difficult to get,” he said, probably in reference to the paintings at the Lusaka National Museum, a few of which include David Shepherd and Akwila Simpasa that are on permanent display and some of which have been lent to the Henry Tayali Gallery for the on-going Independence Week Exhibition. Kambole imagines the sector will be professionally run and it will be easier to get resources allocated to the sector for various projects. “You can imagine there is a cry of lack of finances, this year’s yellow book in fact not the budget had close to K26 billion (old currency) allocated to the sector but this is so fragmented that the monies are not directed where they are supposed to be this is because there is no apex institution”. Again on administration of the arts, he said there are professionals in Zambia with high qualifications although he could only count them on one hand they will be called upon “to steer the boat”. “We have institutions now like Zambia Open University running programmes dealing with the arts and then there was an initiative for the creation of a media university all these steps I think will culminate in producing qualified professionals that will help steer the commission to success”, he said. He said the bill also recognises Public Private Partnerships (PPPs) realising that the private sector is an important vehicle – as earlier indicated by Dr Guo -- to drive the development of the sector. “So the private sector will be held so dearly at the heart of the commission and basically, already we have seen what other private sectors are doing like Zambian Breweries with the music awards”, said Kambole. He concluded by speculating that very soon the bill will be tabled in parliament because it is rare that the president will deliver a policy directive and this means it is at the heart of the presidency and at the heart of the government so he believed that with the same expediency that it was taken to cabinet it shall be delivered. Nevertheless, one is tempted to compare Kambole’s practical concerns towards the lack of ‘educated’ arts administrators and art training institutions to the 580 universities and colleges running creative sector and cultural management programmes in China as revealed by Dr Guo. But it will be interesting to note that China is investing this education in young talent which means they have the future in mind, but one cannot be surprised if the same old Zambian arts administrators cling on to the sector on premise of experience. If so, while they do so awaiting to clock retirement age, let government through the forthcoming commission invest in fresh blood by educating new administrators, even if it means sending them to any of the 580 Chinese learning institutions or other. But again, obviously the 70 individuals and ‘stakeholders’ – as Kombole calls them – that have worked to put the bill together did it all in their collective wisdom. All we can do for now is exercise our delicate powers of observation and hope we do not miss the fast train to China among other things. The just ended African Creative Economy Conference (ACEC 2013) took place in Cape Town last week intended to “focus attention on the continents creative industries, not just as economic drivers” but to also “highlight the potential contribution of the Creative Industries to the eradication of poverty and the building of democracy and human rights” in the words of Korkor Amarteifio the outgoing Chairperson of the Arterial Network, the continental network of creative practitioners that initiated the conference. In addition, Erica Elk, the Executive director of the Cape Craft & Design Institute (CCDI), the organisation that volunteered to coordinate this year’s annual conference suggested that her organisation was committed to “broadening the scope and nature of the conversation because we truly believe the future of our country, continent and planet is dependent on us capturing and fulfilling creative energy”. No doubt the ‘conversation’ at the conference was broad. In fact the variety of conference speakers as well as presentations at the City Hall venue was so diverse that its sheer assortment was a masala that can only be compared to one found at the Eastern Food Bazaar, a few minutes’ walk down the road. In the Eastern Food Bazaar, one can sample a whole variety of reasonably priced, but mouth-watering Asian cuisine from a Chicken Cheese Masala Dosa, sold at the Madras Dosa House, Potato Wada from Bombay Bites, Lamb Shawarma from Istanbul - Shawarma - Falafel or Veg Fried Rice from China Town all under one roof and when confused by the barrage of aromas and flavours in this frenzied corridor of open kitchens that joins Long Market Street to Darling Street it is confusing to make a choice. Similarly throughout the ACEC 2013, delegates were served with such a perplexing choice of presentations by some of the continent's leading thinkers, academics, cultural producers, and experts in music, dance, theatre, visual arts, heritage and museums, design, fashion, craft, festivals and cultural events, film and literature. Also among the speakers were entrepreneurs, politicians and funders that have interest in expanding the creative economies across the continent. Many of the presentations would end up being excessively technical with the speakers producing every manner of pie charts, histograms and statistics that were – wave after wave -- repetitively shelled on the delegates in an effort to illustrate Africa’s global economic position and configure this to how much is, can and should be spent on and earned from the arts. Fortunately, some of the speakers, and particularly those who are artistes themselves were able to pull out the shrapnel of an ‘information-overload’ by sharing their inspirational success stories of projects that have been fruitful -- with very little or no support from private or public funding -- much to the amusement of the crowd, donors inclusive. Key among these was Nigerian, Omoyemi Akerele, Creative and Managing Director, Lagos Fashion and Design Week. Also the founder of Style House, a fashion development agency that focuses on “giving everyone in the creative chain” an opportunity to benefit from the lucrative aspect of fashion. Akerele shared how she abandoned a successful career in International Economic Law to pursue her passion and later become the fashion editor for True Love West Africa magazine and as an African fashion ambassador later earned collaborations and nominations for panels such as International Herald Tribune Luxury Conference, British Council Creative Industries Expo and the Creative Enterprise Forum. 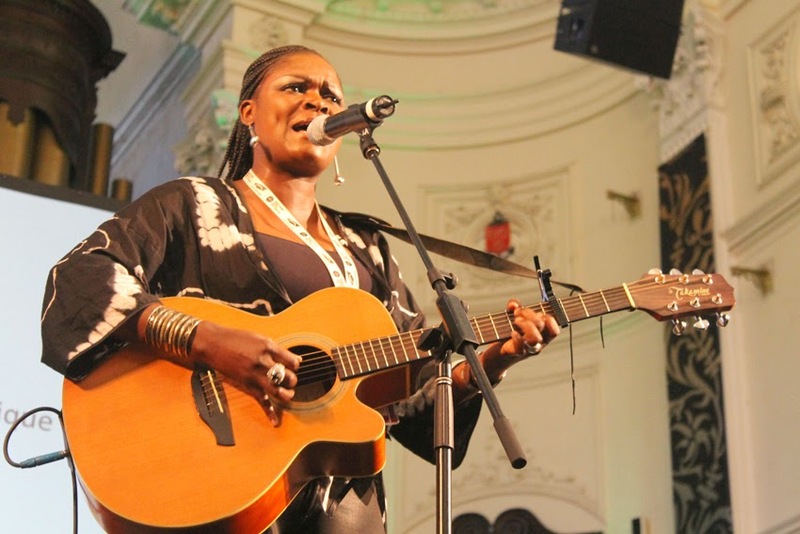 Suzanna Owiyo, an award-winning Kenyan singer-songwriter and musician who fuses western style pop with traditional African instruments shared how she is providing up-coming artistes with recording space at her studio in her native Kisumu. She is also the matron of a girls’ empowerment campaign called Because I’m A Girl. 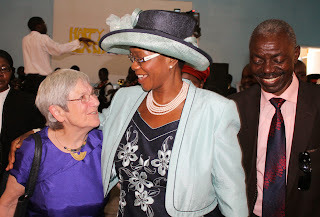 She supports several women and children’s charities through her Suzanne Oyiwo Trust. After her presentation, Oyiwo hypnotised the crowd with a soulful ballade while strumming on her acoustic guitar ala Tracey Chapman. Didier Awadi from Senegal, an award-winning rapper and prominent figure in Francophone Africa’s highly lucrative hip-hop scene explained how his label, a film and music production house called Studio Sankara – after the iconic revolutionary figure, Thomas Sankara of Burkina Faso commonly referred to as Africa's Che Guevara – said he has over 50 full time employees, making him a champion of poverty reduction and job creation using the creative arts. In 2010 he launched Presidents of Africa a project that revisits Africa’s history using speeches from ‘founding fathers’ as material. It was interesting to note however, especially at a conference like this, that Awadi’s studio is named after an African leader who opposed foreign aid, declaring "he, who feeds you, controls you.” Sankara can also be remembered for lowering his salary to $450 a month as president and limiting his possessions to a car, four bicycles, three guitars, a fridge and a broken freezer. Anyway, clearly the firm favourite was Siphiwe Ngwenya former member of South African hip-hop group Skwatta Kamp from the slums of Johannesburg. He introduced the Maboneng Township Art Experience – read about this project in the Saturday Post on the 26 October -- a modest initiative emerging from rejection that transforms ordinary homes into art galleries, casting to the winds the western style of contemporary art sales and presentation, stimulating the question of whether we have adopted the appropriate gallery system to suite our continent. It was interesting however, when these poster boys and girls of grassroots creative entrepreneurship surrendered the stage for a high powered panel of leading funding partners from the ‘developed world’ entitled Why We Invest in and Support the African Creative Sector. There were representatives from the Norwegian Ministry of Foreign Affairs, the United Nations Conference on Trade and Development (UNCTAD), Doen Foundation, Pro Helvetia, the Goethe Institute, UNESCO and the EU. It was heard that the Nigerian-based British Council representative could not make it due to an immigration irregularity. Listening to this distinguished panel it became evidently disappointing that Europe still sees Africa as one country and thinks one type of support strategy can cater for any nation from Cape to Cairo, even when they know too well that cultural policies, trade and political landscapes differ. An observation also highlighted in the Arterial Network’s seven-page Position Paper On Culture In An International and National Development Agenda where it states “…varied conditions within and between nations require a nuanced approach to development rather than a one-size-fits-all approach”. It was also evident through the various presentations that “South Africa” is intentionally misidentified as “Southern Africa” which might explain why they [donor community] is shifting camp southwards. Recently Zambia has seen the continued downsizing of European embassies and the shift of their operations further south. The British Council once a very active supporter of the arts in Zambia, hosting frequent exhibitions and cultural activities has long disappeared from our lips and has been replaced with Alliance Francaise its francophone equivalent that now runs a very lively and consistent arts and culture agenda at its base along Alick Nkhata Road in Lusaka. The British Council libraries that once benefited so many – the author included – were shut down years ago compounding the continuously disintegrating, carcass of a public library system it helped to supplement with up-to-date literature, magazines, academic material and information on scholarships. In April this year the Dutch announced the shut-down of their embassy in Lusaka and foreign minister Uri Rosenthal also announced the closure of three other embassies on the continent as part of “an effort to modernise embassy services and re-focus the priorities for Dutch foreign policy.” The Dutch departure resulted in the donation to the Lechwe Art Trust of a respectable collection of contemporary works by Zambian artists that had been collected at the embassy over the years. But anyway, what do we do when foreign support, mainly funded by taxpayers’ money is pulled out – apart from consoling ourselves with the thoughts of Sankara highlighted earlier -- nothing. A general characteristic that could be sensed in many of the presentations was that Europe seemed to be losing grip on Africa at a very crucial time when the continent seems to be experiencing a rebirth or renaissance as it were. The west is also losing grip at a time when China is all-over the continent albeit in the area of mineral extraction. One of the speakers nudged forward the notion that the west in many cases is accusing China of colonising Africa, a concept that he brushed off as absurd because whereas Europe came to Africa with a Bible and a gun and asked us [Africans] to switch our spiritual faith and give up our land, the Chinese are building roads, cities and railway lines, of course whether the Sino-African relationship is of mutual benefit remains debatable (read more about this relationship next Saturday). Nevertheless, several highlights of the conference brought about open-ended debate, some of the issues will be published in subsequent articles here in the Saturday Post. But two concerns are worthy of noting in conclusion. One is that of dwindling commitment towards the arts in the Southern African Development Community (SADC) and the other is the limbo in which artists stand with regards the commodification of their vocation. Stephen Chifunyise, a Zimbabwean UNESCO technical expert on cultural policy and Principal of the Zimbabwe Academy of Arts Education for Development (ZAAED) suggested that the regional and national leaders are not doing enough. In his presentation he pointed out that the current shortcomings can be put into historical context, he explained that Africa’s creative industries first won formal recognition from the continent’s leaders in 1975. A year later, the Organisation of African Unity (OAU), forerunner of today’s African Union (AU), launched the African Cultural Charter, which placed a particular emphasis on the need to improve training. The charter was followed by a series of action plans, including the Nairobi Plan of Action for Cultural Industries in Africa, launched in 1992, this document remains the benchmark for blueprints of its type but it has triggered very little action. He argued that SADC’s performance has been erratic when it comes to promoting and supporting the cultural and creative sector and was disappointed that the SADC Arts and Culture Festivals could not be sustained but he did not highlight what led to their failed continuity, even though he was on the organising committee of these events. The SADC Music Festival held in Harare in 1995 was the first in the implementation of the idea and since then four other festivals namely the SADC Theatre Festival in Maputo, the SADC Dance Festival in Harare and the SADC Multi–discipline Arts Festival in Johannesburg were held. Chifunyise concluded by emphasising that it was essential to share the lessons learned at ACEC 2013 as widely possible. “Our ideas and our knowledge must become the drivers that change the way Africa treats its cultural and artistic sectors,” he said. Nevertheless, the conference closed with the unsavoury taste of “conviction over profit”; the issue of commodification of the arts. If art is truly an act of the spirit and artists are doing it as a calling we should also bear in mind that artists do have to make a living out of their creativity, they must be rewarded. Current and former Njase Girls Secondary School pupils as well as invited guests were treated to a glimpse of the eight, life-sized murals by the late Emmanuel Nsama that are currently undergoing restoration by William Miko. 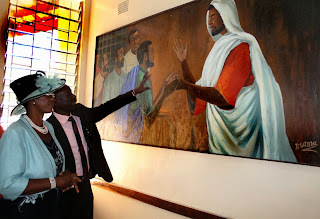 In a theatrical unveiling ceremony in the chapel that coincided with the schools golden jubilee celebrations, Tourism and Arts Minister, Sylvia Masebo – herself a former pupil at the school – undraped the 43 year old paintings that were ceremoniously covered in white cloth for the occasion. noticeably moved by a feeling of nostalgia, the minister broke protocol and inspected each and every painting, one at time, causing a stir – as pews had to be moved aside – in the chapel in which she would attend service every morning for five years as a girl before she graduated in 1988. The murals had been severely damaged due to human contact over four decades. Most of them were severely chipped. Having noticed this during a visit, a German couple Elisabeth and Reinhart Kraft were moved at the sight of the destruction and launched what would be termed the Mural Restoration Project that also gathered the support of former missionaries and teachers at the school who are currently based in the United Kingdom as well as the Gossner Mission. “I would like to thank Mrs Kraft, whom I met in Germany and that’s where she told me about the wonderful work she is doing in Zambia. I told her that what you are doing is a good thing because the murals have a long history. When I was here (at the school) they were very bright, and I would also thank the artist Mr Miko. I’m glad that you used oil (paint) which will last another 100 years. Pupils should also know that those murals are extremely valuable works of art,” said Masebo. And school head teacher Moses Musonda the murals are what are referred to in art as priceless objects because one cannot simply put a price on them. The murals have been away from the school for close to one year as the restoration process was delayed because the artist had to wait for thousands of kwacha worth of professional art materials such as paints and turpentine to be shipped in from Germany. “We did not pay much attention to the murals at first. We thought they were useless, but immediately after they were taken away everyone noticed that the chapel was so empty. So we have been talking for weeks. 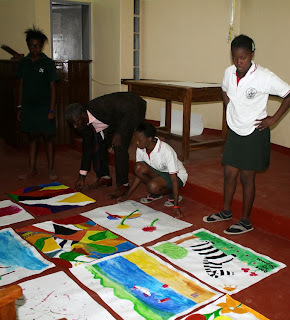 It is also a sign that we have to introduce art in the school so that art can be appreciated, we want to thank Mr Miko for making us understand the importance of art,” said Namweemba Hamoonga the school head girl. “First of all I love viewing art even though I cannot do it myself. 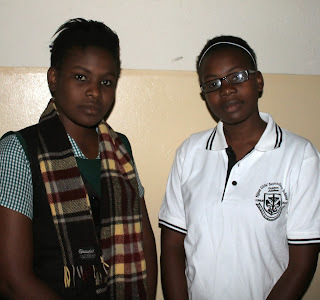 But for the murals, when they were taken away we felt so empty, there was actually a spiritual connection, maybe not for all the girls but surely there was an emptiness that is hard to explain,” added vice head girl Milambo Twambo. And in a speech she prepared for the unveiling but could not deliver it due to what appeared to be a tight programme, Kraft, the restoration sponsor shares what inspired her to embark on the whole mural restoration project and reveals a great deal of personal sacrifice that went into the process. “It was in 2008 when – together with my husband – I saw those pictures for the first time. We both were impressed by the strong expression as well as the beauty of the paintings. Then again in 2011 we came here together with a group from Gossner Mission. That day I could also see how severely damaged some of the paintings were,” reads the speech. Kraft states that from that day she was somehow obsessed by the idea that this treasure should be saved from further damage. She explains it was like a soft, silent voice within her that told her “Elisabeth you can do it”. But once she trusted her inner voice, she believed that God somehow paved the way through all the challenges. Kraft explains that she had found a lot of friends and partners along the way and thanked her husband for putting up with her constantly talking about the murals morning, noon and night. And in a letter to Njase Girls Secondary School Dr. Ulrich Schontube the Gossner Mission director in Germany, as part sponsor of the project emphasised how important the murals were in terms of Christian ministry and cultural heritage. “We are convinced that those pictures are very important as a witness of Christian life, culture and teaching not only in your area but also in the African context. It is a witness of the inculturation of the gospel. God’s word is shown in your language and in pictures making identification possible. So Christ, his disciples, Mary and Martha can be seen not as foreign white but as coloured people. That is a witness of the incarnation of God’s word into a different culture than the European one; it is the incarnation of God’s word into your culture,” reads part of the letter. 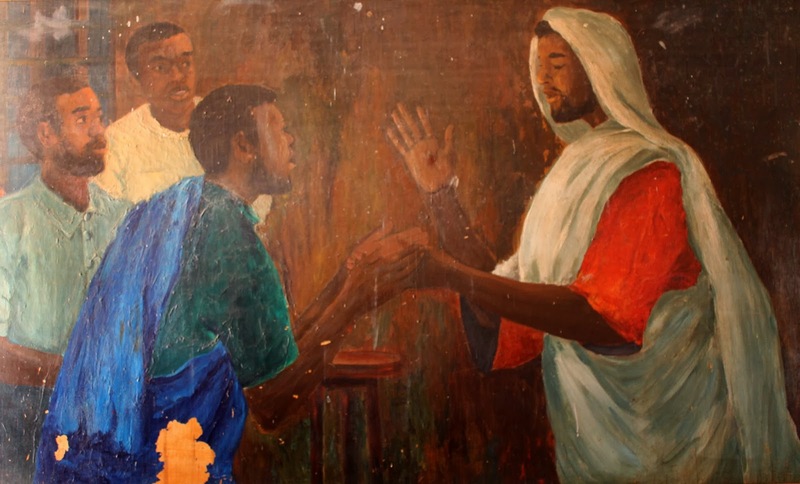 But in his work not only does Nsama attempt to enculture Christianity by depicting an African Jesus, he also made an attempt to bring the bible scenes to the modern-day, or the Zambia of the moment. A good example would be the scene from Mathews 21:1-11 of Jesus Christ’s triumphal entry into Jerusalem riding on a donkey to the enthusiasm of the crowds. While Nsama’s entire cast is African, Jesus is clad in a scarlet robe with a white cloth covering his head, typical of European iconography; a boy in the multitudes throwing palm leaves before Christ is dressed in modern European-style clothing and the woman next to him is dressed in chitenge fabric. And Miko who took the murals back to his studio in Lusaka said the paintings are 97 per cent complete but this can only be noticed by the trained eye. “One of the most important things in this process is switching from the original acrylic to oil paint and also bear in mind that every single painting had to be re-done from the smallest brushstroke to the largest backgrounds” he explained. He explained that the acrylic now acts as a primer. The restoration of old paintings was part of Miko’s curriculum while studying art at the Middlesex University in the United Kingdom from where he graduated with a Bachelor of Arts and later an MA in Fine Art. Miko says he will be done with the final touches in about three week’s time and he will then be able to return the works to Choma. A day before the works were unveiled in Choma, he gave some of the pupils a demonstration of the restoration process much to the delight of the girls. Clad in a crude sleeveless apron made of canvas with the writing “prisoner of art” inscribed on the back, Miko mixed his paints and explained the process right in front of a crowd in the chapel. Among the viewers were members of the school’s art and design club to whom the artist donated materials worth K4,000 (four thousand kwacha) as well as K500 (five hundred kwacha) cash for the purchase of a copy of the Saturday Post every week so that the girls can get acquainted to art through reading Andrew Mulenga’s Hole In The Wall. Emmanuel Nsama died aged 70 in 2011 after a sudden bout of high blood pressure following a normal day of work at his Kitwe home after an artistic career spanning well over 50 years. Nsama spent much of his later years dedicated to painting Bible scenes by commission in churches as well as teaching screen printing and batik techniques to willing apprentices. Still prolific until death, the artist has left over 100 Christian-themed paintings of which Miko intends to help organise an exhibition with the assistance of former Njase Girls pupils, many of whom are well established in society. Nsama’s work will be the core element of a paper by this author (Andrew Mulenga) entitled Indigenized Christian art of Zambian, painter Emmanuel Nsama, that will be presented at the Arts Council of the African Studies Association (ACASA)16th Triennial Symposium of African Art in New York early next year. The paper is part of a panel called African Christian Arts: New Fields Opening that will be co-chaired by Dr Nicholas Bridger Ohlone College, Fremont, California, USA and Dr. John Picton Emeritus, University of London, London, UK. It will study he Christian art of African peoples, especially of the process by which art is adapted to local cultures indigenization or inculturation.